Inside the measuring sensor, there are precision tubes that are energized by an electromagnetic drive system, which itself is fed by the transmitter, to vibrate at their natural frequencies. When a liquid or gas flows through the vibrating tubes, it is subjected to additional deflection due to the degree of inertia that is generated. This deflection is recorded electronically by two velocity sensors and a high-precision electronic time delta. This measured quantity is proportional to the mass flow rate. A further conversion into physical units is done in a purely digital manner using a signal processor in the transmitter. At the same time, all of the appliance’s functions are constantly monitored. Should any disruptions occur, all of the errors that have occurred are immediately reported in the display. The transmitter has a 4 to 20 mA analogue output with programmable span, which is proportional either to the measured mass flow rate or the temperature; it also has an impulse output that supplies mass-proportional impulses. All of the outputs and measuring functions can be verified at any time by the user by using the diagnostic mode in the appliance. The maintenance or new calibration intervals can be monitored via a run-time counter. For service or repair purposes, the transmitter and flow sensor can be replaced independently of each other. This significantly reduces the costs of spare parts for the installed flow sensor/transmitter. During the factory calibration, the mass flow sensor can be calibrated independently of the transmitter. All sensor-specific calibration data can be programmed using magnetic switches located on the front panel. To achieve this, the instrument does not need to be opened. All of the relevant data is buffered in a non-volatile semiconductor device (EEPROM). The RHEONIK mass flow meter consists of one of the RHM series flow sensors and one RHE series transmitter. The remote unit RHE 07/08 is for installation in a safe non-Ex area and is connected to the sensor via a single multi-conductor cable. Please note, that the types RHE 07/08 and all sensor articles are available in non Ex-versions (without Exnameplate). The RHE 11 (Ex d) may be installed and operated in hazardous Ex-areas (Zone 1 or 2). Ex-series sensors RHM (with Ex-Label) are, when connected with an Ex- Transmitter, made for installation inside hazardous areas (Ex-zone 0, 1 or 2). The transmitter RHE includes seven printed boards which can be replaced during servicing. The remote electronic unit consists of two bent measuring loops in the shape of an omega. 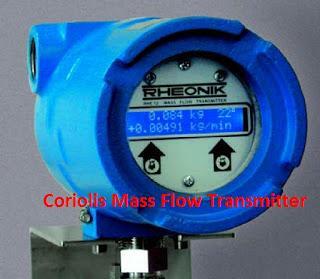 The RHEONIK mass flow meter consists of one of the RHM series flow sensors and one RHE series transmitter. The remote unit RHE 07/08 is for installation in a safe non-Ex area and is connected to the sensor via a single multi-conductor cable. Please note, that the types RHE 07/08 and all sensor articles are available in non Ex-versions (without Exnameplate). The RHE 11 (Ex d) may be installed and operated in hazardous Ex-areas (Zone 1 or 2). Ex-series sensors RHM (with Ex-Label) are, when connected with an Ex- Transmitter, made for installation inside hazardous areas (Ex-zone 0, 1 or 2). The transmitter RHE includes seven printed boards which can be replaced during servicing. The remote electronic unit consists of two bent measuring loops in the shape of an omega. The RHE 12 transmitter is equipped with a 24 VDC mains supply. For trouble-free operation, the power supply must maintain the specified nominal voltage of +- 10%. When connecting the transmitters, always ensure that the power supply is switched off. The earthing for the power supply should be connected using the relevant RHE earthing.